So, yeah. . .I admit it. I’m a bit of an over protective first-time mom. I am. But just a bit. A huge part of my paranoia is devoted entirely to television, and what it’s beaming directly into my kid’s brain. And for right now, The movies made by Disney are some of my biggest enemies. Most recently vetoed was Finding Nemo. I can hear you over there, incredulous tone and everything. Yes. Finding Nemo. Don’t misunderstand, I enjoyed the movie back in 2003 when I first saw it. Which is why I thought it would be fun to watch with my daughter in the first place. It’s a cute movie, yes – but not for toddlers, regardless of clever marketing. At least, not for MY toddler. Not YET. We sat down the other day to watch it together, and about 15 minutes later we were done. She enjoyed what she saw, and everything else I skipped. Crazy? Yeah. . . But hear me out. The film opens up to a scene of terror. 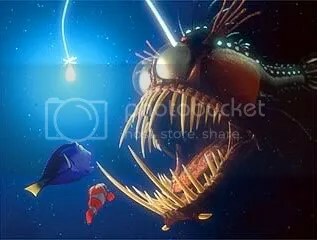 Though he is still unborn, Nemo’s mother and all of his siblings are eaten by a barracuda. Niiiiiiice. JUST what I need my 2-year old to worry about. This is every kid’s worst nightmare – and one that I don’t think T has even thought of yet. Lets keep it that way! It’s traumatizing. . .it is. And when you really think about it, nearly EVERY Disney movie involves the death of parents, or the evil replacements for parents that are already dead – 9 times out of 10 its the mother. Whats up with that? Next scene: Nemo is older, and it is his first day of school. His father is very nervous about his son’s safety (considering the tragedy that befell the rest of his family, I find this understandable). Nemo, of course, is embarrassed by his father’s hovering. Everything was going okay. 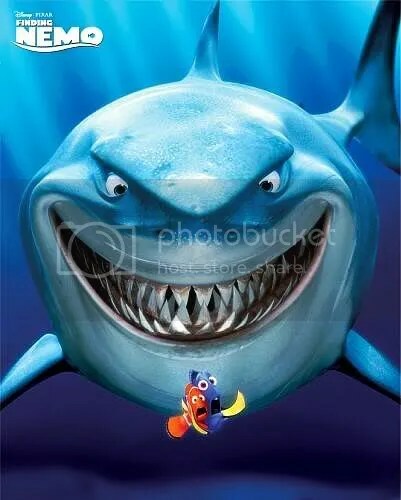 . . right up until Nemo tells his father that he hates him, and deliberately disobeys him by swimming into the open water, and refuses to return when his father tells him to. All of this before Nemo, inevitably, gets captured by a diver (in a frightening scene) and taken away from his father and the home he knows. . .
Wow. Does this sound like a lot for a tot to process? 1. T does not yet know the word hate. I’m fine with that. I don’t need her telling me she hates me until she’s a little bit closer to thirteen, thank you very much. Regardless of the words, she doesn’t speak to me in that tone of voice – even if I’ve made her angry – and she doesn’t need to start. Yet. 2. T is willful enough as it is, what with her being two and all, and we do NOT need to encourage this behavior. While it is true that Nemo gets into an awful lot of trouble because he doesn’t listen to his dad, I don’t know if T will grasp that, and even if she does – KIDNAPPING and IMPRISONMENT is a pretty severe punishment, dontcha think? The whole end of scene is a bit too scary for her, anyway, what with all the screaming and such. . .
An extremely frightened Nemo is put into a fish-tank in a dentist’s office. He is to be given to a little girl who is notorious for killing fish. Great. In the background a screaming patient is having a root canal. T is scheduled for her first dentist visit this week. This is not the impression I want Puff to carry of the dentist! Meanwhile, Nemo’s dad is having more than his fair share of frightening scenes to be skipped through. . . including possible death or dismemberment by sharks, angular fish, and a jellyfish colony. And skip we did. I won’t bore you with the rest of the movie, save to say that it all ends happily (duh, Disney) and that it has been put away for a few more years. . . I like the movie, I really do – it’s just a bit too much for her right now. Its frikkin’ SCARY! And the score is so dramatic, it intensifies the tension by about 97 percent. So what did she actually get to watch? The turtles. We loved the turtles. The turtles were awesome. . . even if I suspect that Crush was stoned outta his mind. . . I know, don’t worry – I’ve heard it before. Like I said – I’ve taken a lot of flak for some of my parenting decisions – this being a MAJOR one. One of the biggest arguments I hear is “They don’t understand!” And I guess thats really it. The root of my movie paranoia. I don’t believe that. Not for ONE second. She DOES understand whats happening on that screen, but imperfectly. . . and while I don’t think it would ruin her life to see these things, and I don’t think any less of anyone who does allow their kids to watch – which, yeah, is just about the entire rest of the world – I think we’ll just stick to short shows like Blue’s Clues and good ol’ Sesame Street for now. So what do YOU think? Am I over-the-top protective for banning Disney (and other ‘children’s’ movies) for another couplea years? I’m right there with you on that one and a bunch more of them. I started the girls Disney club collection, but half of them they won’t watch. In fact there are only a couple they will…Aristocats, Cinderella, and A Bug’s Life. And this isn’t just Madalyn’s decision, its Marissa’s. In fact if it was up to Marissa they wouldn’t watch A Bug’s Life either, but since Madalyn isn’t scared she thinks the grasshoppers are funny too. I don’t think so at all. We’ve only two we’ve ever kind of watched with Trent were 101 dalmations (he loves dogs so he was purely mesmorized by that) and Aladdin (I was slightly older when that one came out and can remember it didn’t upset any of my sisters or the younger cousins). If you’re looking for a girly one, I think Cinderella should be fine- yes her parents are dead but they don’t really cover that, there’s some forced housework, happy singing mice, fairy godmothers, and nothing scary that I can remember (sure, they lock her in the house for a bit…). I think that you are rather hilarious. You have REASONS for every bit you skipped over, including, but not limited to(I’m sure), the induction into the aquarium “tankhood.” Mafia/gang activity anyone?…not to mention peer pressure to put yourself in harm’s way by jumping into the filter with a freakin’ rock! That being said, at the tender age of 2, Kayda was watching Finding Nemo every day for like…2 millenia. Yeah, I know she’s not that old yet, but…that’s what it felt like at the time. It was the only thing she’d sit and watch for the longest time. She’s fine…doesn’t tell me she hates me and is not the one that says, “I don’t like you” either. That’s Colby and while she HAS seen Finding Nemo, I don’t think that’s where she got it from. Colby’s a whole different entity altogether and comes up with these things on her own. Sleeping Beauty, however, is a different story. That freakin’ Dragon Witch THING scares the CRAP out of Colby. Kayda’s not afraid as she knows the difference between what’s real and what’s not and will even tell me, “Mom, that’s not REAL.” Colby however, is so empathetic that she can feel the fear emanating from the television(maybe the tv is scared too?). We watched Monsters Vs Aliens the other day and my poor daughter was so freaked out in the first 20 minutes(with the glowing, growing bride) that she was pointing at the tv, whimpering with tears in her eyes! Once in my lap, however, she was fine and enjoyed the show. They watched it one more time, the following day, and she was perfectly okay with the show, though we still returned it to the Redbox with no intention of purchasing it. You are fine. I agree, they understand more than people give them credit for. Tori saw some scary stuff in Tinker Bell and turned off the tv. She still wanted to watch it, but would turn it off when the thistle and hawk came on. We’ve worked through it. Discussing that there are scary things out there, and here’s how we can deal with it (the fairies work together to save the other fairies and get rid of the mean hawk…and the thistle are just very active). She loves Cinderella, but she knows that the sisters and stepmom are mean. She’s said that. They understand…don’t let anyone tell you otherwise. Well, I’m glad to know I’m not the only one! And yeah. . .some things I can explain her through – but with Nemo, it was just one scary thing after another after another – jut too much drama for us. I’m thinking we’ll open the Disney vault when she’s closer to 5. . .I don’t think it would really have a huge impact on her development, but. . . I’d rather not even go there. I don’t see a NEED for movies at this age. Even her 1/2 – 1 hour of TV is pushing it, I think. . . Which is fine. We both prefer snuggling up with books anyway, (I’ve never been a big tv/movie watcher) and, to be honest, I doubt she’d actually sit through an entire movie even if I did let her watch it! Sarah – I think its cool that the girls let you know that they don’t like to watch them. Smart kids! Plus it takes the worry away from you. You can be confident that if its too much, they’ll turn it of! Awesome! Maygan – As far as girly Disney goes. . .we have watched The Little Mermaid, but I skipped a bunch of it. Pretty much everything with her father losing his mind and the seawitch was skipped. Even with all that skippage, there was a LOT left to watch, and loads of fun songs. 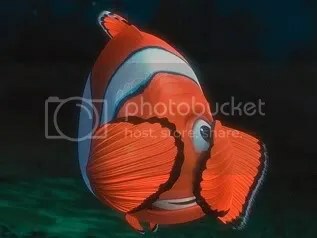 Nemo was just. . .skip skip skip! She also really liked the new Tinkerbell one. We may have to get that one, it seemed milder then most. Fan – I’m all about the static idea – white noise is supposed to help kids sleep, neh? Sounds like a grand idea! And as far as cats eating mice. . .erm. . .I’m afraid to say that is a sad fact of life that our fuzz-ball has already introduced T too! I just don’t like to hear the words EVIL and MOTHER in the same sentence. . .even if STEP is in between! Wecki – oddly enough, I don’t think Monsters Inc would bother her in the slightest! T’s favorite book EVER is Where the Wild Things Are, we have to read it several times a night. She’s all about monsters – but I don’t think its ever occurred to her that they’re supposed to be scary! Therin lies the difference between books and movies. We can tell her how the Wild Things roared their terrible roars and gnashed their terrible teeth all we want. Without the dramatic music and visual effects backing it up (except for mommy and dad looking like nutjobs, which is pretty hilarious to Puff) it just doesn’t hold the scariness that Disney sends through in the movies. That said, I’m still pumped to see WTWTA, and hoping T can get through it – though it does seem a bit old for her. You already know my point of view on this but I think your CRAZY!!!! it was my idea to watch it becasue my babies love it! They don’t see it as scary they love it! I think your thinking into it way too much! She wont get all the things your scared of! but its ok she’ll miss out on the best movie of all time till she’s 6! I personally think that trying to get a kid under say 4 to watch a movie is pointless anyway. They haven’t got the attention span required. Of course my 1 year old, that you’ve never met either, is typically relegated to nothing but ‘Toddler Tunes’ anyway. I’m not sure that Sesame Street and the like are needed but we’ll likely watch them once she understands a bit more. I say all of this and yet after the 5th time on a Saturday that I’ve heard a song from ‘Beauty and the Beast ‘ I have been known to put it in. 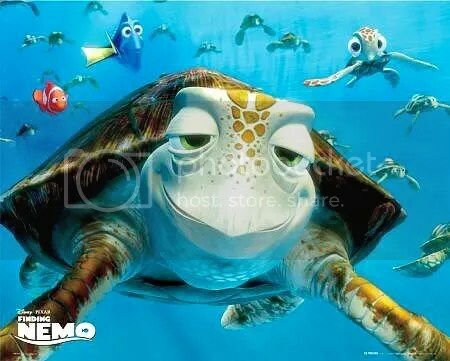 Which happened once and made me far more critical of that movie then you are of ‘Nemo’. So I say huzzah! to being wise enough to censor what your munchkin watches! If only more parents actually cared…. well that’s a soap box for another day. All I can say is I found this and thought of you and this post. If you check it out it should help you feel better about your anti-Nemo ways. Enjoy!